This dip packs a surprising amount of flavor - warm, nutty, spicy, pungent. And it couldn't be easier to make! I am including this recipe in this month's SOS Kitchen Challenge, the monthly recipe challenge from Ricki from Diet, Dessert, and Dogs and me. 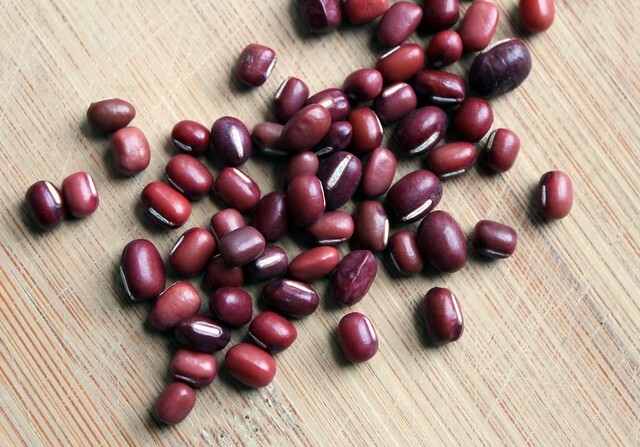 This month our featured ingredient is none other than the versatile adzuki bean, one of my favorite legumes. 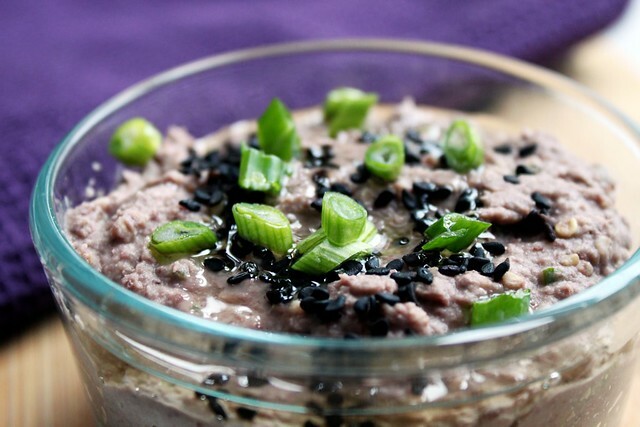 I often use adzuki beans for various bean dips, often highlighting them with the flavors present in Asian cuisine. 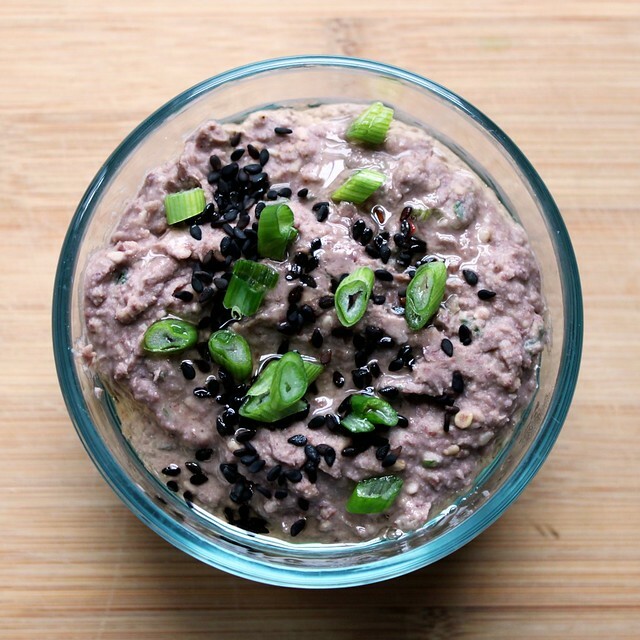 This dip is no exception, featuring toasted sesame oil, ginger, garlic, and scallions. It is rich and creamy, and is a great way to jazz up raw vegetables, crackers, or collard or brown rice tortilla wraps. Or, if you're anything like me, you'll enjoy a scoop of it served on a plate with brown rice, sauerkraut, and sauteed greens. Want to participate in the adzuki bean fun this month? Simply cook up a new recipe–either sweet OR savory (or both)–using adzuki beans, following the usual SOS guidelinesfor ingredients and submission requirements. Then submit it by linking up to your blog post with the linky tool, below the recipe. Be sure to add a link to this page on your post, and if you wish, include the SOS logo. Your recipe will be displayed on both Ricki's and my blog in the Linky, and will be featured in a recipe roundup at the end of this month. We look forward to more of your delicious, creative, enthusiastic entries this month! Place beans, tahini, oil, miso, ume vinegar, garlic, ginger, and red pepper in a food processor and process until smooth. If too thick for your liking, add leftover bean cooking liquid, broth, or water until it is the desired consistency. Then add sesame seeds and scallions and process briefly to mix in. Serve! If using as a dip in a serving bowl, garnish it with sesame seeds and finely chopped scallion, and a drizzle of toasted sesame oil, if desired. Refrigerate leftovers in a well-sealed container for up to 5 days. Newer PostMPLS Swappers: Food Swap Love comes to Minneapolis on March 19!